Halla María Svansdóttir. Photos courtesy of Promote Iceland/Food Organisation of Denmark. As part of our year-long celebration on great women in travel, we're shining a spotlight on Iceland. When it comes to equality for women, the country is ahead of curve. 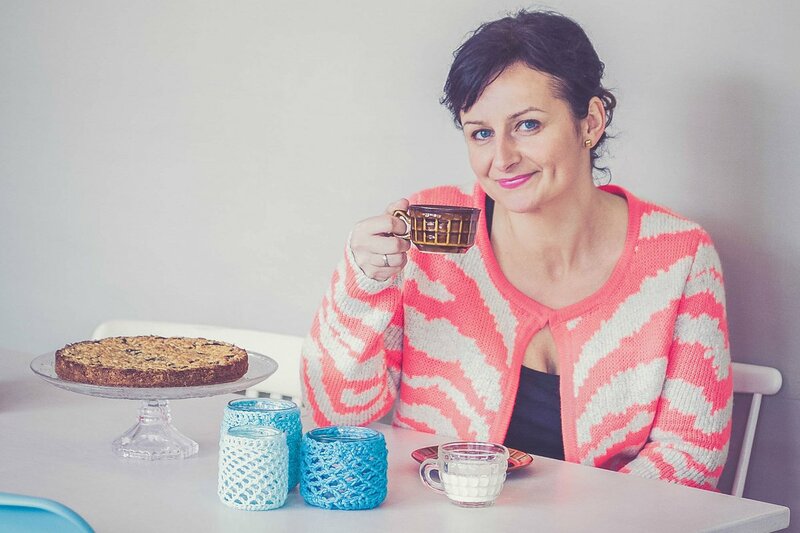 These five female culinary entrepreneurs are showing us how it's done. ICELAND — On January 1, Iceland passed the world’s first equal pay for equal work law. Under the Equal Pay Standard, the legislation requires that companies with 25 or more employees obtain certification proving that employees are paid equally, regardless of gender. So when Fathom sent me on a trip organized by Promote Iceland and the Food Organisation of Denmark to discuss equality with women in Iceland’s culinary world, I expected so much. Victorious fanfare! Palpable energy! And pink hats! But while Icelandic women were pleased, they were practically unphased. In fact, I soon saw, the women of Iceland do everything. Traveling with a troupe of eight from Reykjavik to Flúðir, I met woman after woman who’d boldly started a successful food business, from whiskey distiller to tomato farmer. Each one exuded a striking calm, a confidence in herself and her work that I was drawn to as a female business owner myself, knowing all too well that nagging question of enoughness. There’s no shortage of risk in their ventures, but these women seem to think to themselves, Somebody’s gotta do it. Why not me? And their country responds: Yes, you! Since 1991, Iceland’s Ministry of Welfare has awarded grants to women entrepreneurs with innovative business ideas that will create jobs. Iceland’s commitment to gender equality is absolutely foundational, and they continue to push even further ahead. What is even more remarkable about Icelandic society is the prevalence of first-generation family businesses started by women. So many stories begin with one woman’s idea and end with the entire family working together, spanning some four generations. The “I depend on me” definition of an independent woman (to quote Beyoncé) is not how Icelandic women roll, and it is not what the country demands. They work hard, and they do it alongside the people they love. They accept help. And they remember that their family is their business, too. It was such a lesson to me: You can be creative and driven, pursue ingenuity, and still create a sustainable life for you and your family. Maybe you really can do it all. Here are five inspiring women working in food, drink, and agriculture who exemplify that. 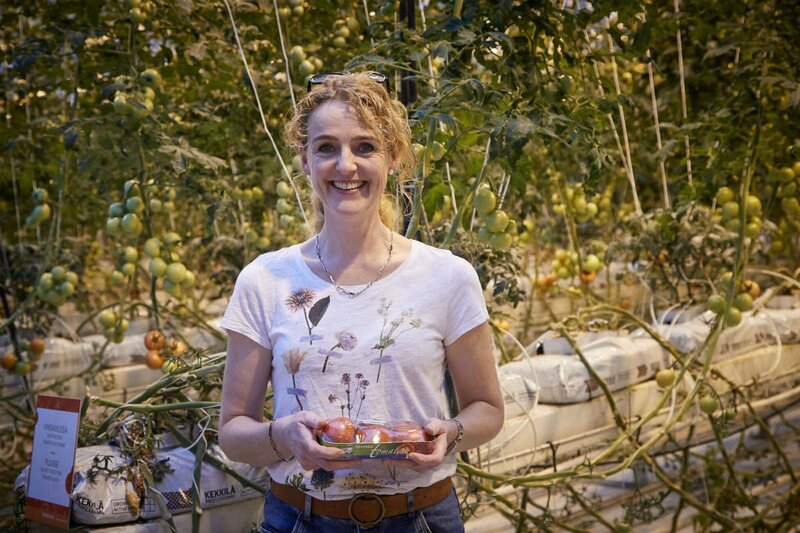 Helena Hermundardottir with her tomatoes. “Welcome to my farm,” Helena Hermundardóttir began, standing before a tumbling curtain of red and green tomato vines. She was surrounded by the artificial solar lighting of her largest greenhouse, the patron saint of horticulture. Along with her husband Knútur, Helena owns Friðheimar, a year-round tomato farm and restaurant in Reykholt, about an hour’s drive from Reykjavik on Iceland’s Ring Road. When the couple bought the farm in 1995, it was a ragtag bunch of abandoned green- and glasshouses. 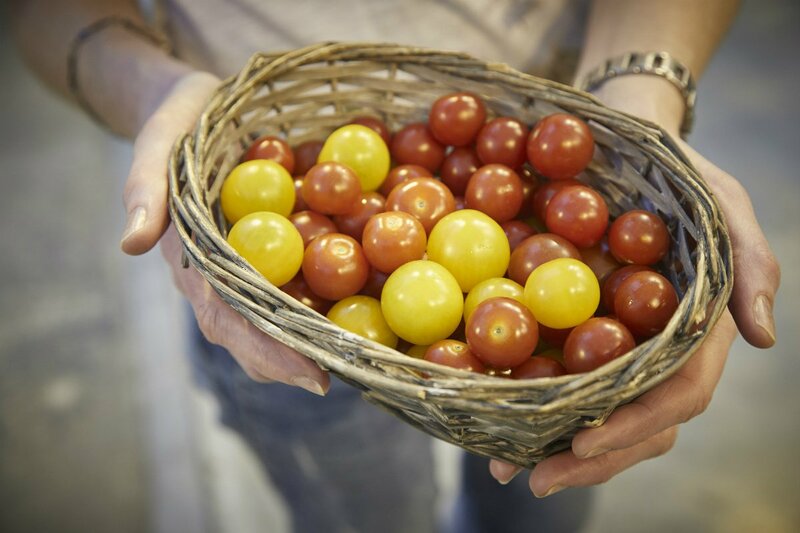 Today, they are the second largest tomato growers in Iceland. At Friðheimar, 370 tons of plum, Flavorino cocktail, and Piccolo tomatoes are grown annually using geothermal energy from a nearby hot spring and zero pesticides. Along with ten employees, Helena and Knútur’s five children play a large role in the business — from picking tomatoes and turning the vines to helping with the restaurant and Knútur’s summertime Icelandic horse show, also on the property. Helena opened the farm’s greenhouse restaurant in 2011, three years after she started hosting tourists (up to 160,000 annually), hoping to provide an experience within the plants. Tomatoes and basil reign on the lunch menu, served from noon to 4 p.m. The farm’s “ugly tomatoes” are the star ingredients in soup and fresh pasta, as well as ice cream served in a terracotta pot. The best meal I had in Iceland was cooked by Halla María Svansdóttir and her mother. Halla’s cafe Hjá Höllu, a ten-minute drive from the obligatory tourist destination the Blue Lagoon geothermal spa, is a family affair: Her mother helps in the kitchen, her father and brother run deliveries, and her husband creates the restaurant’s highly trafficked online ordering system. The restaurant feels like an extension of Halla’s home — Scandinavian modern in its design but warm and welcoming, with fresh-baked bread cooling on the counter alongside mismatched cake domes filled with pastries. We’d just visited a nearby cod fishery and production facility, and not a half-hour later I was served the most beautiful piece of cod I’d ever seen. (Yes, cod can and should be beautiful.) 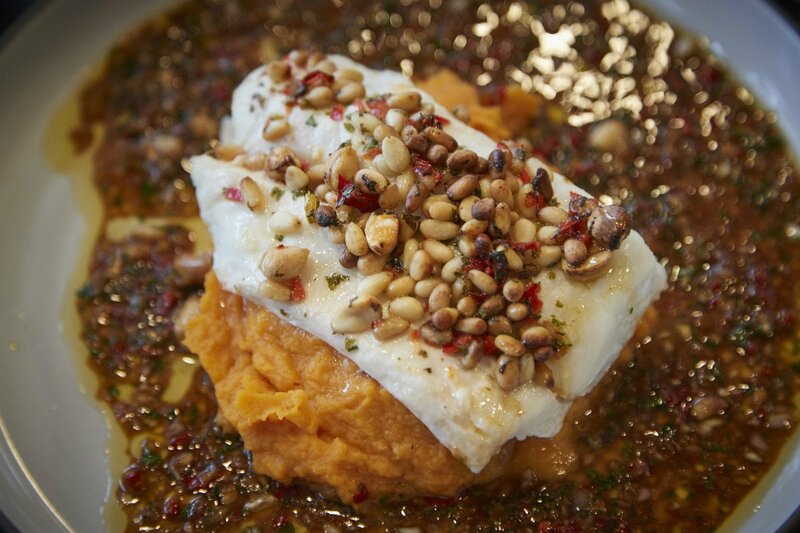 It sat atop sweet potato mash and was swimming in a pine nut salsa and soy butter. Alongside came bread boards with Halla’s loaves made from scratch, plus two house pestos. The daughter of farmers, Halla always knew and loved fresh food, but it wasn’t until she had children of her own that nutritious and organic food became a non-negotiable. In 2012, she began teaching nutrition classes out of her home and cooking raw and organic food for her students. 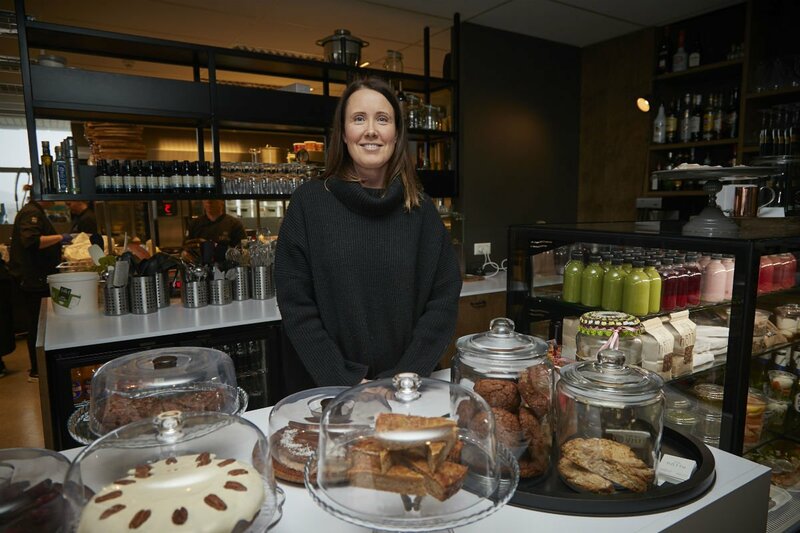 This evolved into a lunch catering service for businesses and individuals and finally into brick-and-mortar when Halla opened Hjá Höllu in a former bank in the heart of Grindavik. The restaurant bustles with locals and tourists daily and still receives between 300 and 500 lunch orders for delivery every single day. Agnes Anna Sigurdardottir and her beer. Life gave Agnes Anna Sigurdardottir lemons, and she made beer. When her husband Ólafur, a fisherman for 26 years, sustained a career-ending knee injury at sea, the couple suddenly had to start from scratch. How would they support their four children? 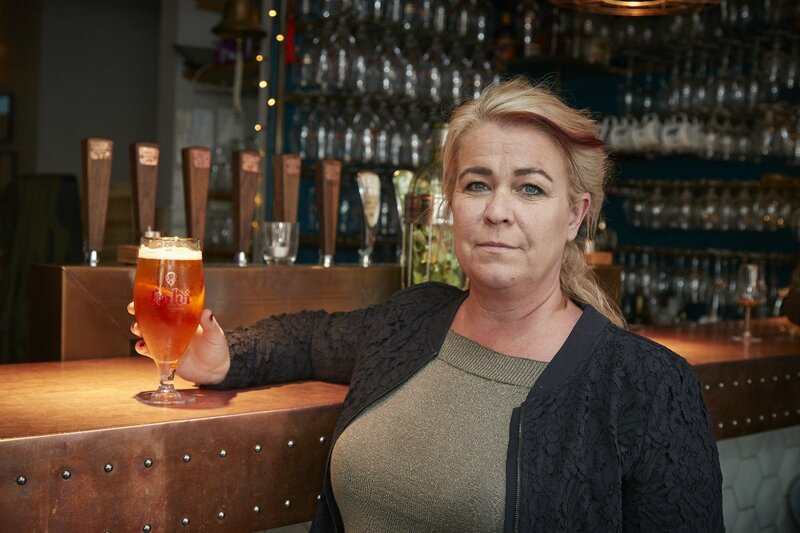 Struck by a television interview with a Danish brewer, Agnes thought she could make great beer using the spring water flowing from Sólarfjall mountain in her backyard. And just like that, their fishing village Árskógssandur (population: 100) became the unlikely home of Iceland’s first microbrewery, Kaldi. At Kaldi, now ten years old, Agnes, Ólafur, and their second-oldest son Sigurður (Siggi) make Czech-style beers, which are unpasteurized, with no preservatives or added sugar. Siggi (26) is Kaldi’s brewmaster and a part owner in the brewery. His two younger siblings, Ester and Svavar, work with him in the summer. Agnes’ father and her uncle support Kaldi financially and serve on a board, and Ólafur works full time in the brewery as a brewer with his son and is the chairman of the board. They work hard, and they do it alongside the people they love. They accept help. And they remember that their family is their business, too. Kaldi beer is prevalent all over Iceland — including brews like a dark pilsner, IPA, and Stinnings Kaldi made with angelica picked on Hrisey island, which gives it an anise flavor. They offer tours of their brewery every day and last summer opened the Kaldi Beer Spa, a traditional Czech bathing treatment that includes beer, yeast, hops, beer salt, and beer oil and purports to improve skin conditions, reduce wrinkles, hydrate skin, open pores, stimulate circulation, and even increase metabolism. All that, and you get a a Kaldi beer to sip on. Berglind Sigmars. Photo by Kristbjörg Sigurjónsdóttir. I accidentally met Berglind Sigmars and her husband Siggi during my last few hours in Iceland. They own Gott ('good' in Icelandic), a restaurant in the Westman islands, with a just-opened second location in Reykjavik that I stumbled upon on its second day of operation They’re the kind of people you just want to be around — confident, joyful, and relaxed, even amid the chaos of a restaurant opening. They told me about how all this began, with their son Sigmar. He was diagnosed with Tourette Syndrome at age ten, and Berglind and Siggi were told that the only solution to help his compulsive behavior would be medicines that had their own heartbreaking side effects. Berglind refused and began experimenting with Sigmar’s diet, removing gluten, sugar, and dairy. Within six months, his tics were completely gone. She wrote about this journey, the lessons she’s learned, and the recipes she cooks for her family, and became a best-selling author in Iceland for two cookbooks, Heilsuréttir Fjolskyldunnar (“healthy meals for the family”) and its sequel. This way of eating is the foundation of their restaurant Gott, which opened in 2014 in the couple’s hometown of Vestmannaeyjar. It serves about 300 people every day in 38 seats and is beloved for for being kid-friendly, affordable, and healthy. But not too serious — there’s still dessert, there’s still a burger. The whole community volunteers to help at the restaurant, which lends a homey vibe. Berglind and Siggi’s fathers come to the restaurant at 9 a.m. every day to tell stories, drink coffee, then get to work fixing things and picking up the recycling. Neighbors offer to iron linens, and, when Gott opened, they donated dishes. Siggi and Berglind’s kids help in the front and back of house during the summer Sigmar cooked alongside his dad before leaving for school — still symptom-free. 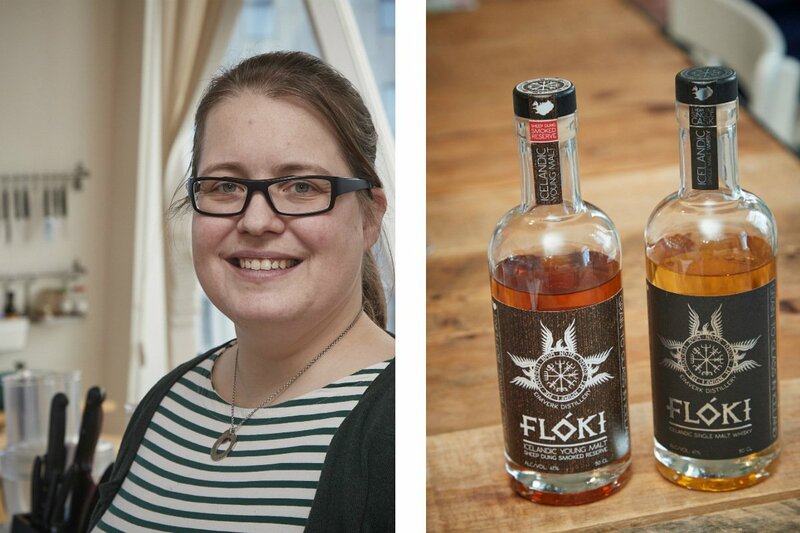 Eva María Sigurjónsdóttir and her whisky, Flóki. Eva María Sigurjónsdóttir and her three cousins were camping, drinking whiskey as they gazed across the barley fields on their family farm. They wondered, “Why isn't anyone making whiskey with Icelandic barley?” And so the foursome founded Eimverk Distillery in 2009 — Iceland’s first and only whiskey distillery. Eimverk uses 100 percent Icelandic barley grown on family-farms around the country, including their own, a vital part of the company’s mission to create spirits fully of the place. They also produce gin and aquavit that burst with Icelandic terroir, the gin tasting of juniper, birch, rhubarb, and kelp.